I started playing with SpotOn3D the other day. 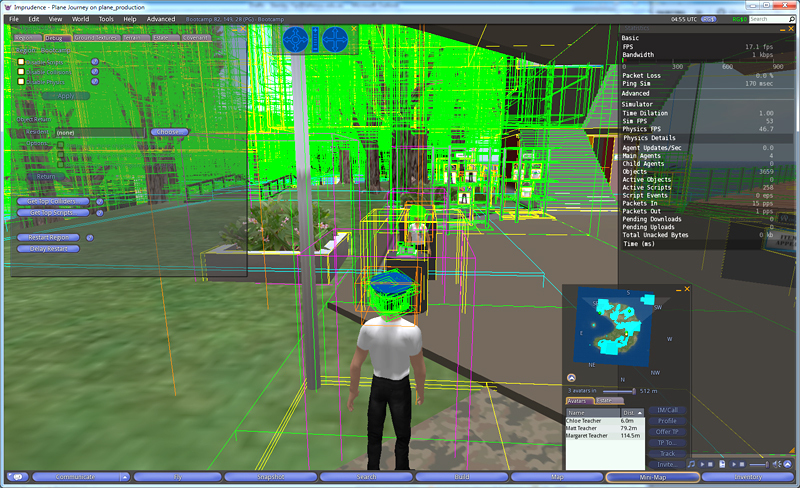 It’s a browser based virtual world experience. You need to install the SpotOn3D plugin. Looks like it’s also using an IFrame to make it an even more seemless experience from browser to viewer. Went in world and meet one of the residents Teresea Harrington. I finally hunted down the rogue runaway prim from a few weeks back. This was a bounty that was worth the effort. I think it was causing a lot of the physics engine issues we’ve been having. It was a cube prim set to Physical and every time the island was loaded the prim would fall through the ground and continue to roll into the ocean and keep falling into negative terrain as far as you could see on the virtual world Map. You would be able to see and track it on the Mini-Map but not be able to select it. 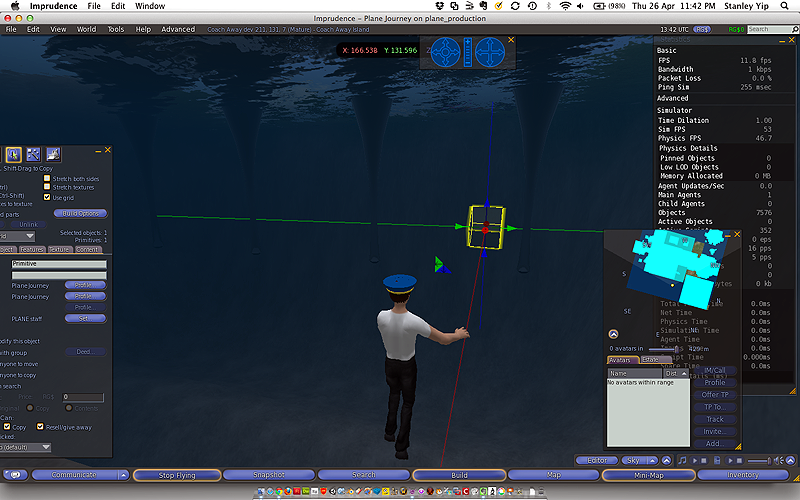 To hunt it down I only had a small window to get to the location it started at, (I used a Landmark), then face the correct way and make sure the Build menu was active and on the Selection Tool then quickly draw a window around the falling prim, all whilst under water. I had a weird back to the future causality moment as I inspected the properties of the prim and saw I was the creator of it. I had forgotten that I originally made it a few weeks back to test and optimise the island (and in doing so kick started this timeline of events). 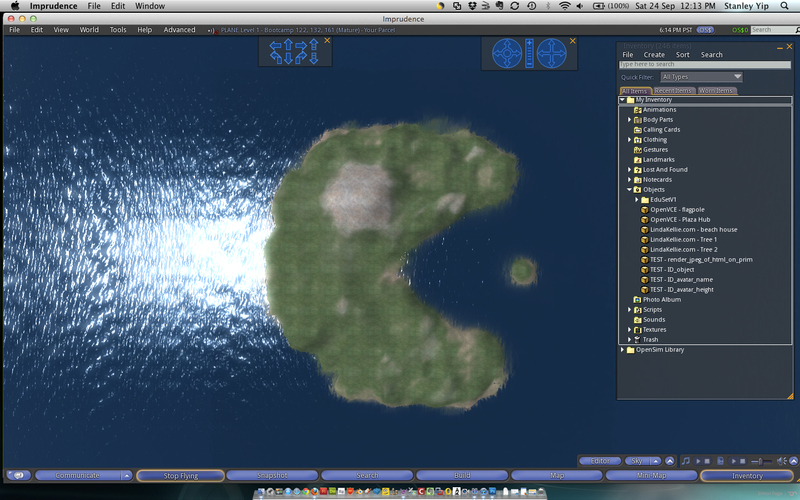 For the last 2 weeks I’ve been focused on optimising our PLANE virtual world Bootcamp and Coach Away Islands. The end result we have a very lean Bootcamp (3951 objects) and a reasonable Coach Away Island (5725 objects). 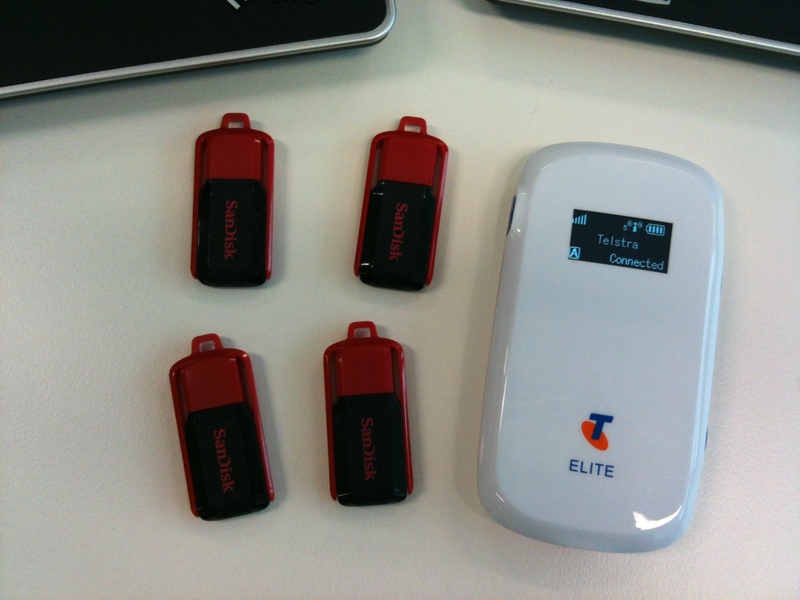 They are now quite performant, less than 300ms ping times and consistent frame rates in the 20fps levels. Still some work to do to make it even more smoother and then to also put it through its paces with load testing. In Photoshop I used a combination of the brush tool and the eraser tool to add and delete black and white areas. I used a large, soft brush (between 40% and 60%) with minimal hardness, (about 5%). 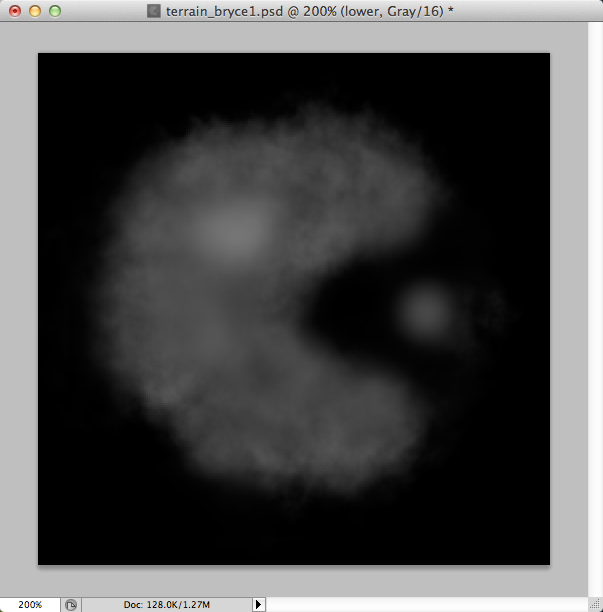 Exported the image as a 16 bit grayscale PNG then used the load terrain OpenSim server command to load the terrain. For more fine grained terra forming I plane to use the standard terrain build functions in the Imprudence client. My avatar is appearing as a gas cloud! After a day of debugging this one I have found a solution. Login to the region with an avatar that is working fine. 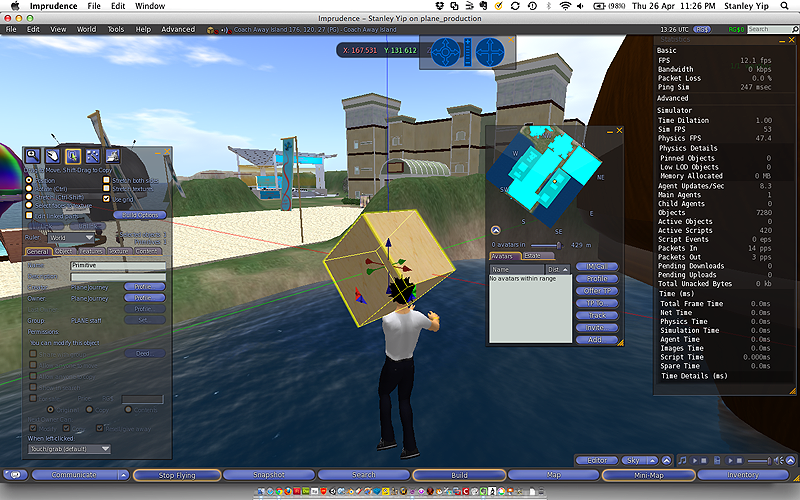 On another computer login to the region with the ‘broken’ avatar. 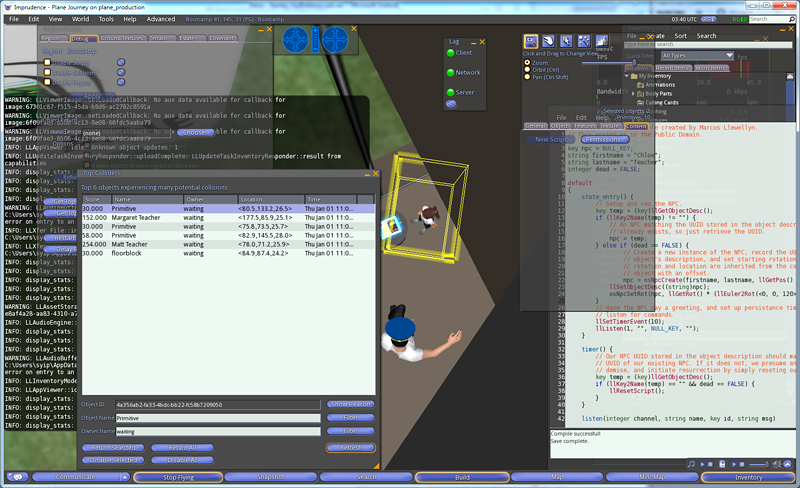 Using the working avatar right click on top of the broken avatar to show the pie menu and click on ‘Send IM’. 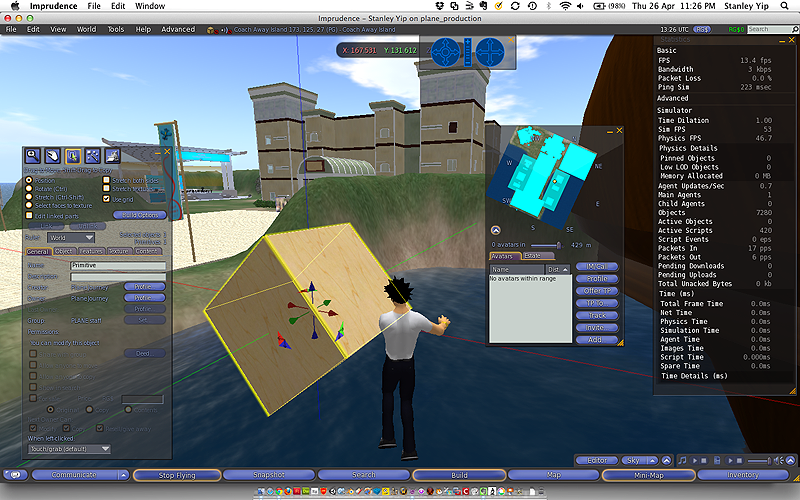 Drag and drop from your inventory the shape, skin, eyes and hair to the window that popped up from the broken avatar. The cloud will now disappear from the broken avatar and be a clone of the working avatar. Now you can customise the avatar as usual.